After researching the Saturday Review of Literature, my conclusion is that its a publication that ties up a lot of loose ends in early 20th Century publishing. What I found interesting about the Saturday Review was that while it was most definitely Henry Seidel Canby’s baby, it’s origins also directly involve Cyrus Curtis, publisher of both Saturday Evening Post and Ladies’ Home Journal, and the TIME, Inc. team of Henry R. Luce and Britton Hadden, plus it also directly ties into a neat little web of connections through both Harvard and Yale. Henry Seidel Canby, (1878-1961), taught at Yale after graduating in 1899 and became full professor in 1922. In 1920 Canby established the Literary Review section of the New York Post, a weekly supplement which also involved Amy Loveman, Christopher Morley, and William Rose Benet. The Literary Review only had a circulation of about 10,000, which was low but at the same time national and influential. 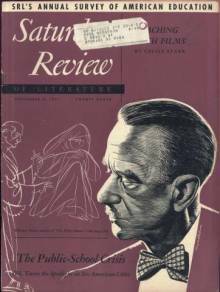 When the Post’s Publisher, Thomas W. Lamont sold the paper to Cy Curtis in 1924, Canby and staff quit and it appeared that the popular Literary Review was dead. Lamont, however, was a big fan of the Review and would contact his old Harvard classmate, Roy E. Larsen, who was the circulation manager of fledgling TIME Magazine. Larsen, of course, worked for Luce and Hadden, who either ironically or appropriately were both students of Canby’s at Yale! Naturally a deal was brokered leading to the creation of The Saturday Review. TIME, Inc. would publish the new magazine, Lamont would invest $50,000 into it, and Canby and his team from the Post would put together the editorial. 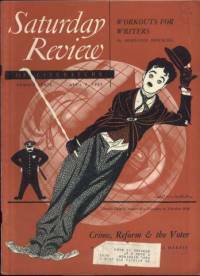 Due to copyright issues with a pre-existing publication in Britain, the magazine’s title was lengthened to The Saturday Review of Literature and the first issue was published in August 1924. (It would shorten its title to simply Saturday Review in 1952). TIME itself had only debuted in March 1923, and from their start a little over a year later the Saturday Review team of editors would share TIME’s offices and employ their circulation manager, Larsen, to conduct its own circulation and promotional campaigns, including a two-page ad inside TIME. The two groups split because of TIME’s move to Cleveland in 1925, but they continued to get along and Larsen actually remained on as Vice-President of the Saturday Review of Literature until 1932. “Readers of the little magazines no doubt would have regarded the Saturday Review of Literature as hopelessly middle class; but first as a somewhat sober literary journal, eventually as a lively magazine of ideas and the popular arts, the weekly probably affected the reading tastes and helped to shape the thinking of an influential segment of the population” (353). “Canby’s magazine addressed … literate readers who could enjoy the juxtaposition of Shaw and H.G. Wells, who enjoyed writers like Ellen Glasgow, Edith Wharton, Willa Cather, Thomas Hardy, Joseph Conrad, and E.M. Forster, yet still welcomed such new writers as Hemingway, Lewis, and Faulkner. These readers did not take themselves so seriously, however, as to disdain writers like Robert Benchley and Ring Lardner” (215). Both Bernard DeVoto and George Stevens would see time as editor after Canby, but the magazine was edited for the longest period of time by Norman Cousins, under whom circulation would climb from approximately 20,000 in the early 1940’s to over 650,000 in the early 1970’s. Cousins was appointed by Canby in 1940 when he was just 25, and remained editor through 1971 when he resigned. 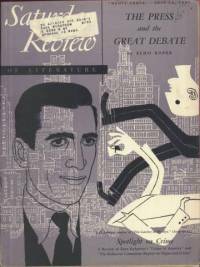 While under Henry Seidel Canby in its earliest days the Saturday Review focused on critical writing while both DeVoto and Stevens concentrated more on book reviews. Cousins kept the book reviews but incorporated other relevant elements from arts and culture into the magazine making Saturday Review more of a general magazine. My experience selling this title is limited to a healthy pile of issues from the early 1950’s, more towards the beginning than the end of the Norman Cousins period, but definitely reflecting his changes. Each of the issues I handled included a couple of feature articles which were often about literature or publishing but sometimes veered slightly off course and covered topics such as education. Departments included regulars such as the self-explanatory “SRL Goes to the Movies,” “TV and Radio,” “The Film Forum,” and “The New Recordings.” Several issues also included “Booked for Travel,” a vacation and travel article as well as a Double-Crostic to keep readers busy for the rest of the week after they finished reading the articles. The classifieds appeared to have been a popular feature as well with headlines taken from a random issue such as “Out-of-Print,” “Books,” “French Books,” “Bookplates,” “Back Numbers,” “Record Mart,” “Literary Services,” and most notably the “Personals” which included ads such as: “Artist would share Carolina country studio with writer”; “Woman, wide interests, desires correspondence with mature man”; “Sane, sensitive English major seeks stimulating position with magazine, radio, or other mass media concern”; “Charming girl correspondents wanted by young economist”; “100% freethinker seeks correspondence with available freethinker miss”; “Composer wants poems, lyrics”; and “Once acclaimed as talented writer here, abroad; now recovering from long illness; seeks job”. These were all pulled from the May 19, 1951 issue of Saturday Review of Literature. And, of course, the mainstay of Saturday Review … the reviews! These were divided into categories such as Fiction, U.S.A., Belles-Lettres, Music, and more, plus the departments were often used for reviews that fit into each column. Typically in the issues that I paged through the featured work for an issue featured the reviewed works’ author on the front cover and the review itself was placed prominently towards the beginning of the issue. Also, alongside the review there would be a sidebar about the writer of the reviewed work. 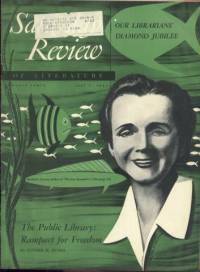 So, in, for example, the July 14, 1951 issue of Saturday Review of Literature the cover features J.D. Salinger as drawn by Arno from a photograph by Lotte Jacobi, and the Fiction section then begins on page 12 with a review of The Catcher in the Rye. The review is titled “Manhattan Ulysses, Junior” and includes the title, author, publisher, page count, and price of the book ($3 if you were curious), and then a review written by Harrison Smith which spans two pages, but actually totals closer to a full page of text. About a quarter of one page is boxed off from the review and is headed The Author with another small sketch of Salinger in the upper left corner of the box and several lines of text about J.D. Salinger. As a dealer I enjoyed paging through my pile of issues, and am curious to see how they sell. Again, my experience here is limited, but it is a title that intrigues me. The covers are somewhat ugly and the magazines are printed pretty cheaply, but with occasional cover gems such as Salinger or Thomas Mann, and reviews of some of the more intelligent books of the period, I do see some potential if marketed correctly. My research for this page has made me quite curious to acquire some of the early Canby issues, both to examine on my own and to see if they can make a buck on the market. As I handle more issues of the Saturday Review I will update this page with my findings insofar as both contents and marketability. Closing this brief history of one of the 20th Century’s smarter publications, the Saturday Review would see its best days through about 1971 and Cousins’ resignation, and then survive through some confusing times in different editions through its 1987 purchase by Bob Guccione’s General Media. Guccione, of Penthouse fame, would give the Saturday Review its last gasps as an online-only publication on AOL in 1993. As of 2003, the time of the LookSmart article referenced below, Saturday Review was still in General Media’s hands with nothing planned for its future.